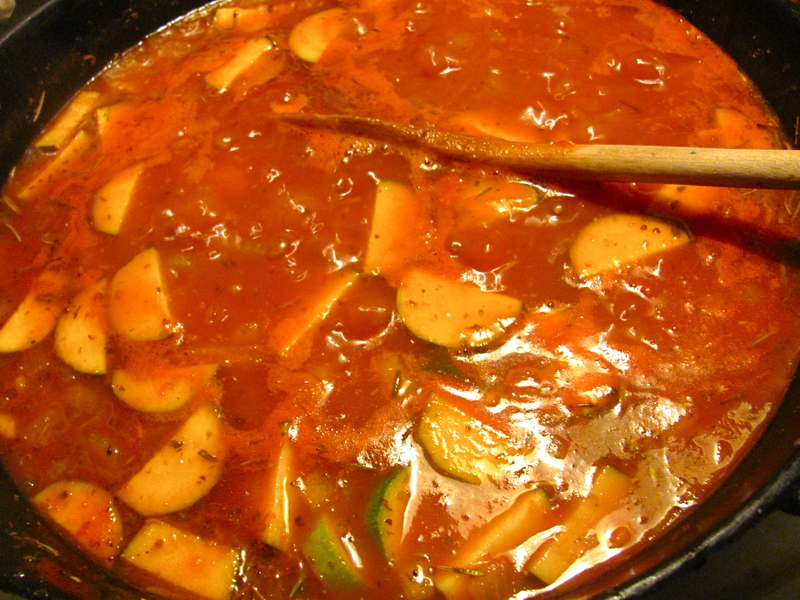 I came across a Hearty Italian Vegetable Soup in an email today, and since I had a zucchini in the fridge I decided I needed to make it for lunch. I pinned it, and then printed the recipe. 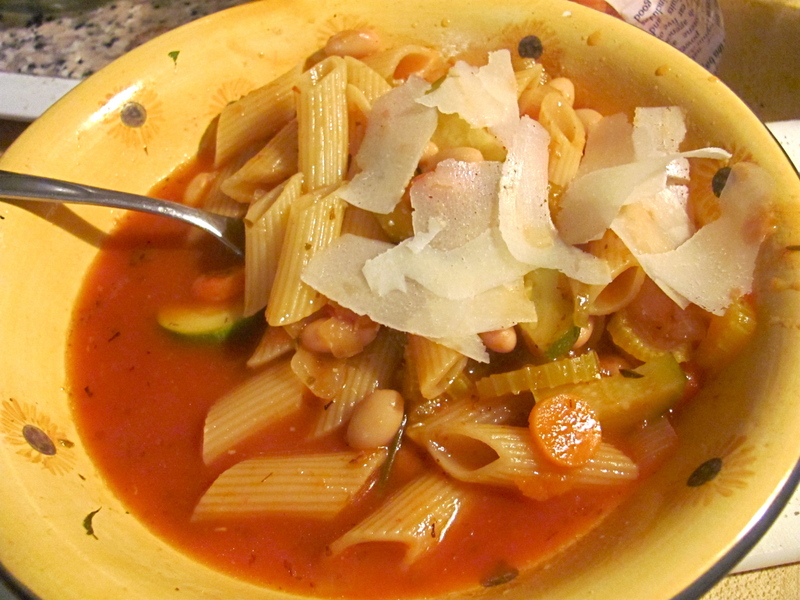 I made a few changes off the top, mostly to the sequence of events, and switched out the broth, the beans and the tomato products. My recipe—with the changes—is below. 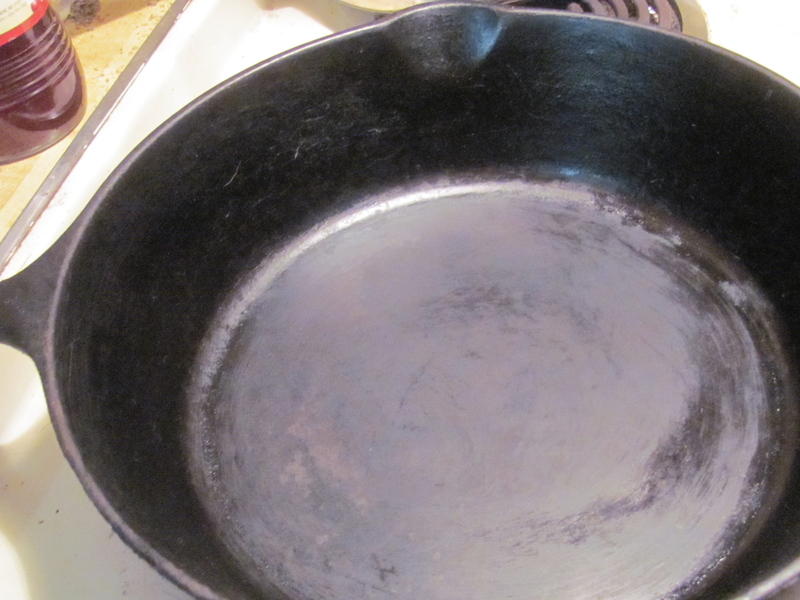 I started with this deep cast iron skillet acquired at a garage sale. Paid a whopping $5 for the rusty old thing. The size is midway between a skillet and a Dutch Oven. I cleaned it up and this is my first time to use it. Should have taken a “before” picture! It was a mess. Ain’t it purty? Cleaned up right nice, din’t it? Beautiful seasoning! This is what a well-seasoned iron skillet is supposed to look like! My plan was to resell it because it was so gross I didn’t know if I could get it all the way back. But I might be in love. Even though it’s a no-name skillet, it will do the job. Celery and onion went in first. I always chop the onion last, just in case it makes me cry. When the onions and celery are soft and smelling good, I add the garlic. Garlic will burn if you cook it too long or if the heat is too high so I wait to add it just before the next step. I added the carrots here because I’m not a fan of soggy cooked carrots. Adding them now means they still have some crunch when the soup is done. If you like soft cooked carrots, you can put them in the pot at the beginning. This is where I added the dried oregano. I could have added it sooner, but I forgot. 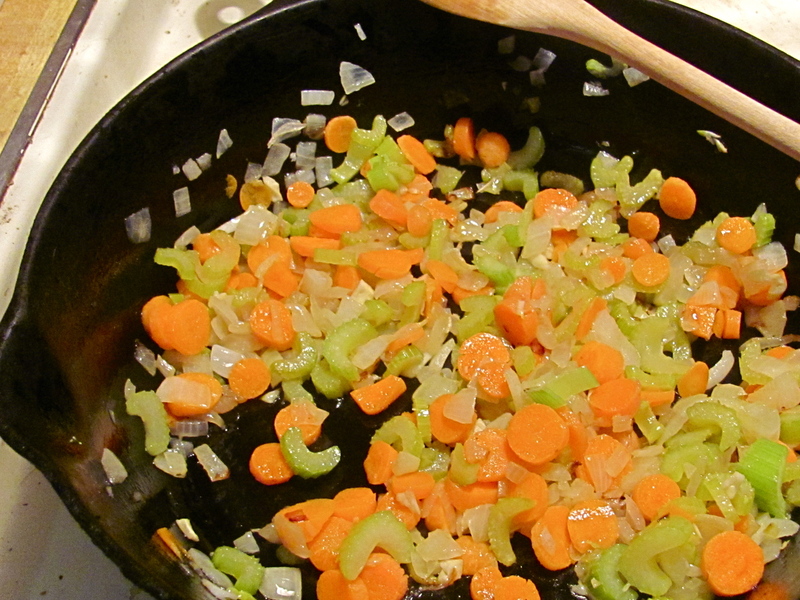 I like to stir it around and coat the veggies with it before adding the liquids. I don’t know if it’s true or not, but I think the veggies take in more flavor when I do this instead of letting the herbs just swim around in the liquid later. Now I add the broth, crushed tomatoes and tomato sauce. 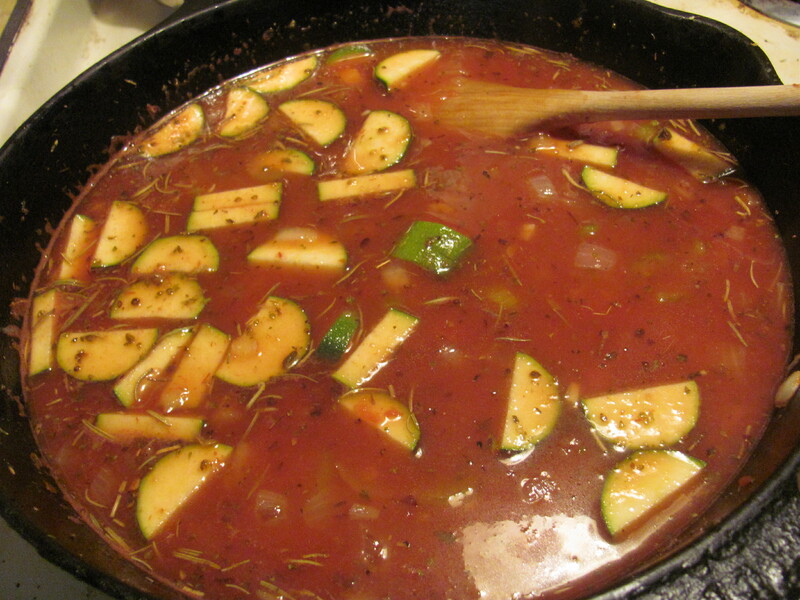 Then the zucchini—I don’t like soggy zucchini either—and the rosemary. I intended to drop in a sprig of fresh rosemary, which is why I didn’t put it in with the oregano, but instead of taking the time to go outside and snip some, I used what I had in the cabinet. While I waited for everything to come to a boil, I built a salad. 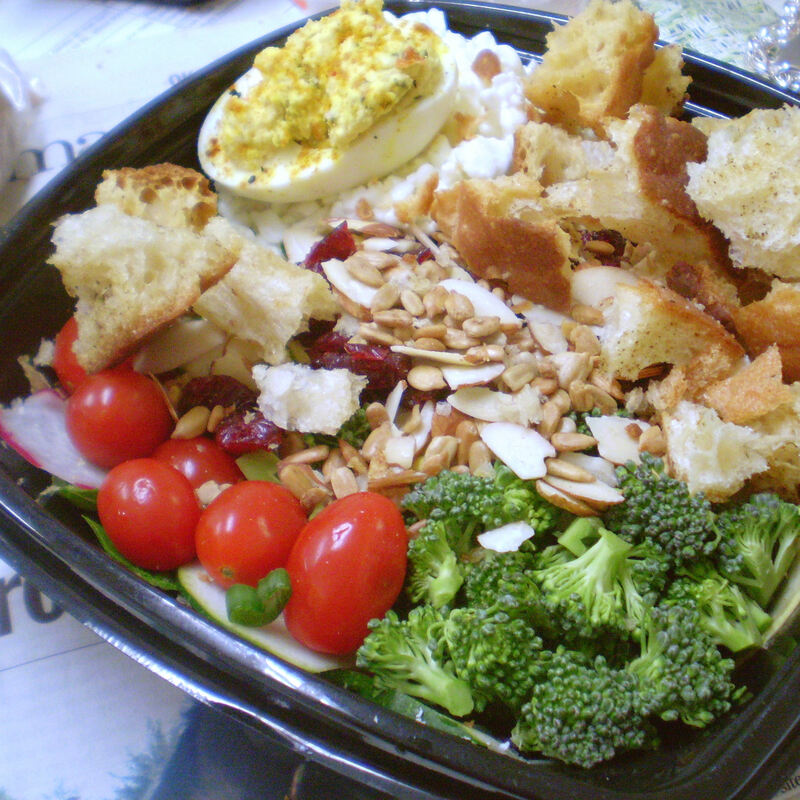 A couple of handfuls of spring mix; two slices of seasoned, crispy, oven-baked French bread croutons, broken into pieces; a sprinkle of sunflower seeds; and some slivers of Parmesan. I dressed it with homemade vinaigrette: olive oil, cranberry vinegar (homemade), brown and spicy mustard, Worcestershire, Tabasco, garlic granules, and sugar). … I added the pasta. Then I ate my salad. When I finished the salad the pasta was done, and, as pasta does, it absorbed a lot of liquid. 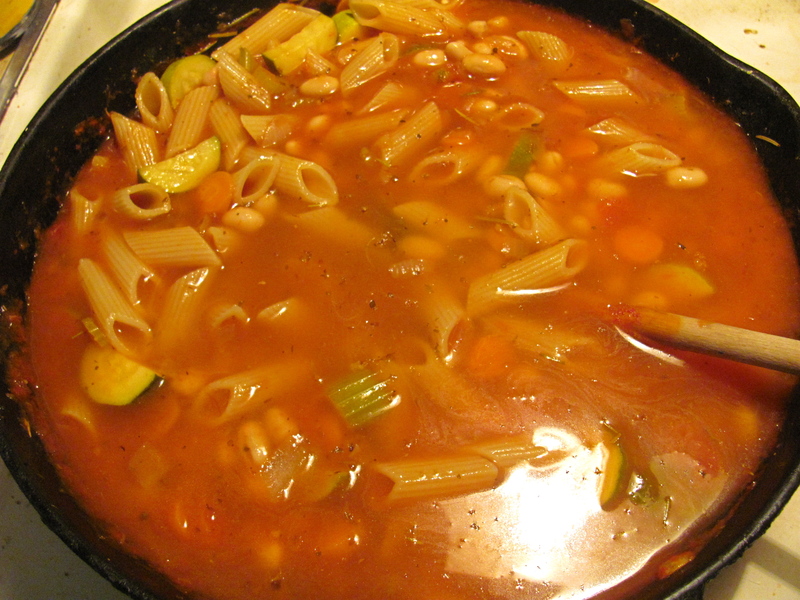 I added the beans with the liquid (again, I don’t like soggy, smushy beans) and filled the empty can with water to add to the soup. I didn’t want to dilute the flavor, so I sprinkled a teaspoon or so of chicken bouillon granules on top and stirred it into the mix. Salt and pepper to taste. I only added a smidge of salt but I gave it several good cranks of the pepper mill. I add pepper to practically everything. Then I spooned it into my salad bowl. I used a wooden stirring spoon so I didn’t get a lot of liquid. I gave it a good splash of Tabasco and garnished with slivers of cheese. I used a potato peeler. It was 1 hour and 4 minutes from the first picture to the last. The original recipe said 30 minutes, 10 for prep and 20 to cook, but I couldn’t do it that fast unless I had help chopping the vegetables. This would make a yummy brown bag lunch with a salad, and it will freeze well for leftovers. Leftovers and freezing are two more reasons I don’t overcook the veggies. 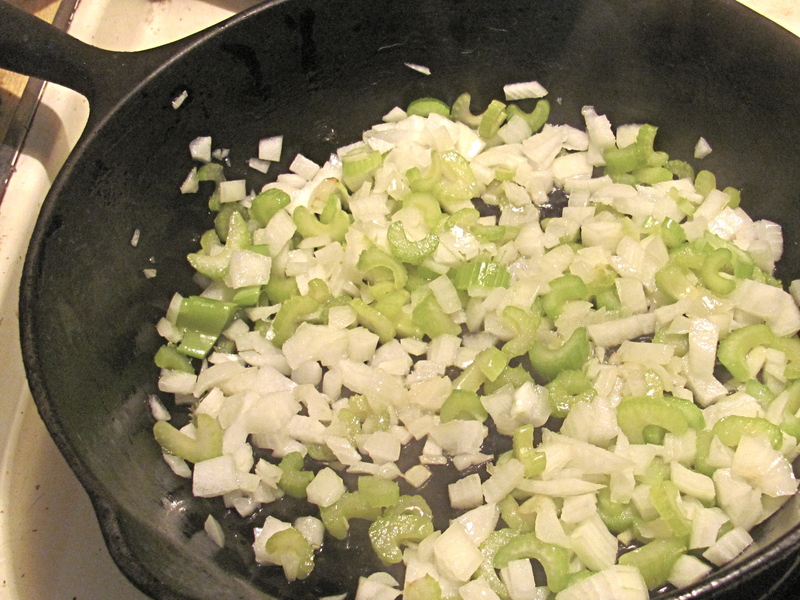 3 large stalks Chopped Celery In Dutch oven, sauté onion and celery in oil. 2–3 Garlic Cloves Minced garlic Add garlic to sauté. 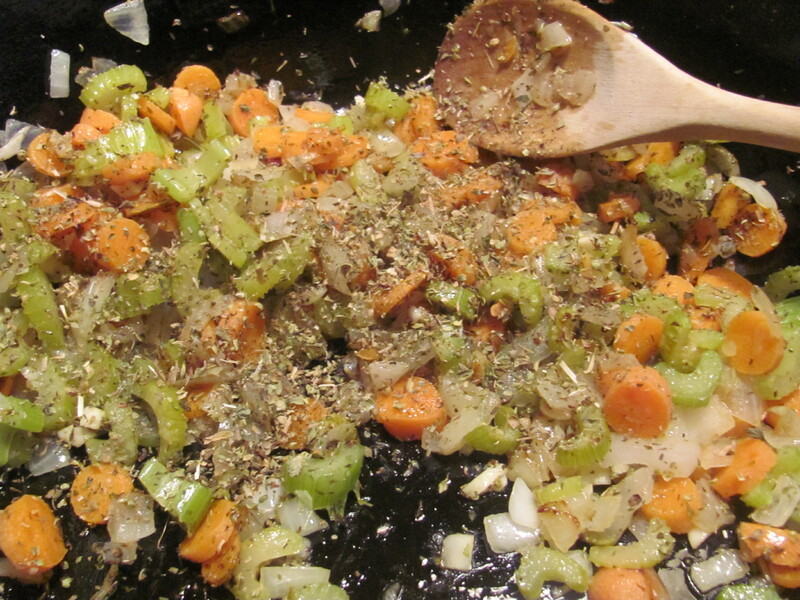 1–2 tsp Dried oregano Season with dried herbs, stir to coat veggies. 2–3 carrots Chunky chopped carrots Add carrots. 1 32 oz box Swanson’s Chicken Broth Pour in broth, crushed tomatoes and tomato sauce. 1–2 stems Fresh rosemary Add rosemary and zucchini. Bring to a boil. 2 cups Uncooked pasta Add pasta. Stir. Cook al dente. Eat your salad while the pasta cooks. 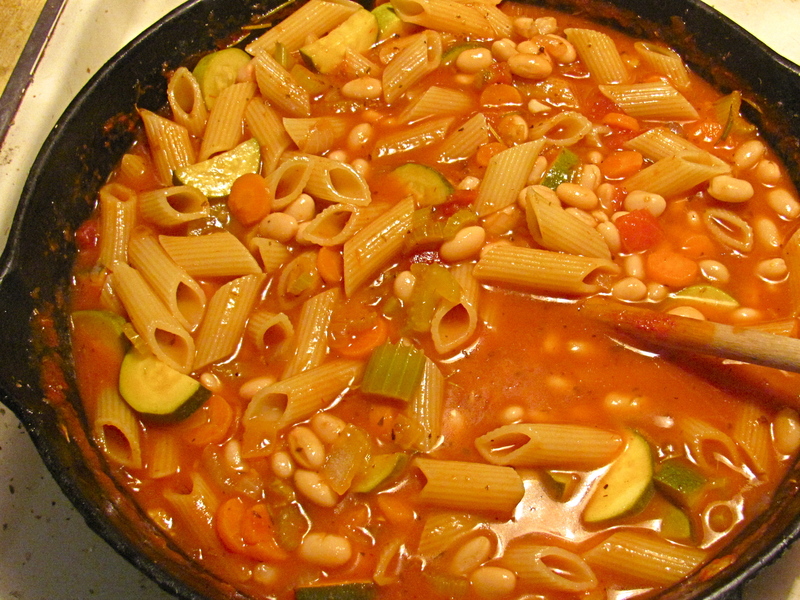 1× 15.5 oz can Great northern beans Add beans and liquid. 1 15 oz. can Water Use the empty bean can to add water. 1–2 tsp. Wyler’s Chicken Bouillon Granules Sprinkle on top. Stir. Finish eating your salad and then ladle the soup into your salad bowl. Here’s what I’ve had for lunch the past few days. 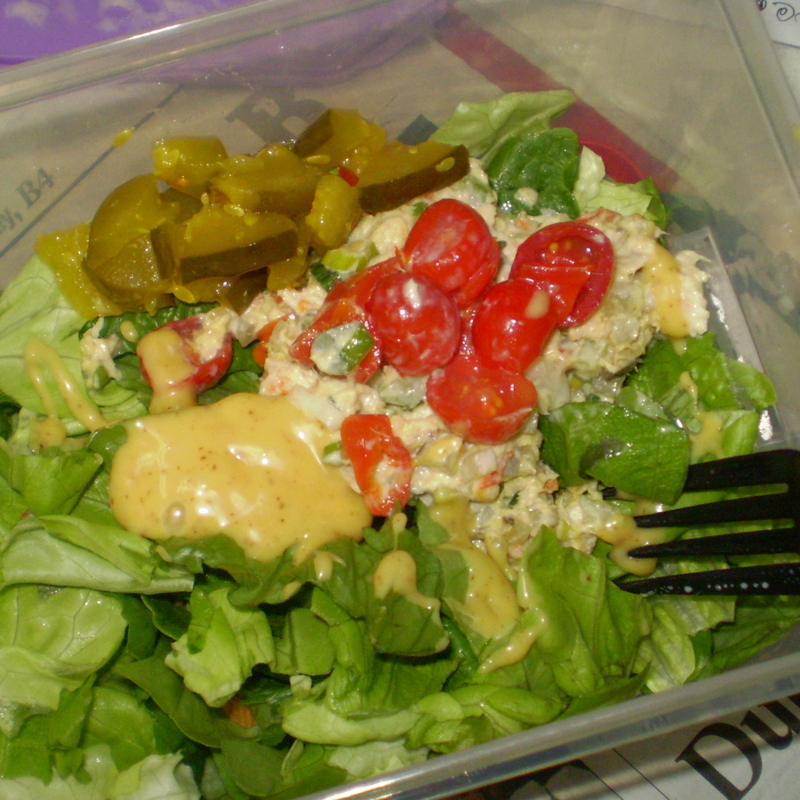 Friday I put the leftover tuna salad on top of a bed of romaine and butter leaf lettuce topped with a few tomatoes, bread and butter pickles and honey mustard dressing. I planned to get my lunches for the week organized over the weekend and have them read to go on Monday, but alas, I didn’t. I spent the weekend researching my family tree and editing a paper for my nephew so, nothing happened in the kitchen. 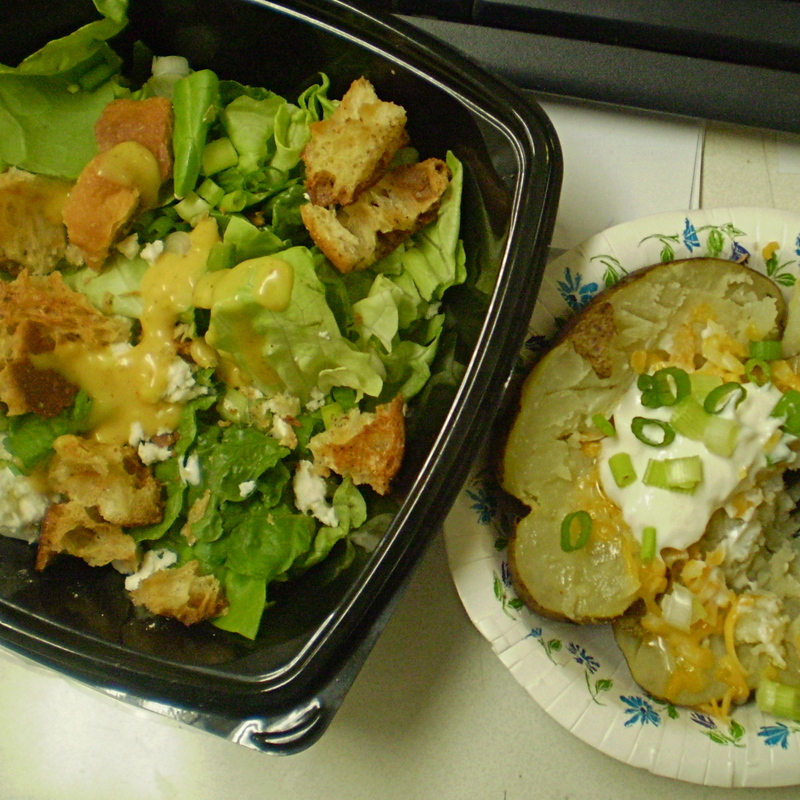 On Monday, I put together a pile of lettuce for a simple salad, grabbed an already baked potato, some sour cream, green onion, cheese and I was good to go. 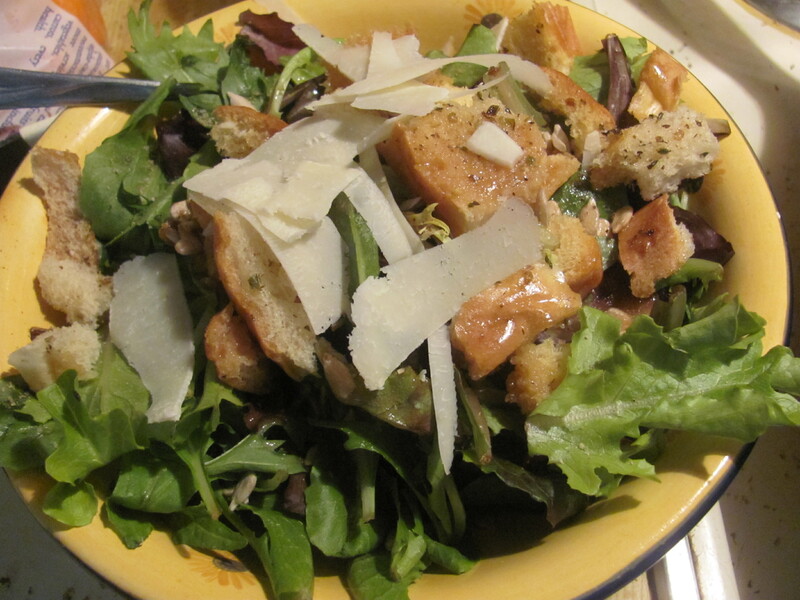 The salad was romaine, butter leaf lettuce, feta cheese, sunflower seeds, croutons, and honey mustard dressing. I cut the potato in half and zapped it in the microwave and then add butter, sour cream, green onion, and grated cheddar cheese. The baked potato was planned, I just didn’t know when I would need it. One evening last week I baked about 5 potatoes. I doused them in olive oil and wrapped them in foil and put them in my toaster oven until they were tender. I ate one when they were done and turned a couple of small ones into hash browns sometime over the past few days and I had two left. I ate one Monday and had the last one today. Yesterday I had another salad and some crackers and cheese and tomato juice. 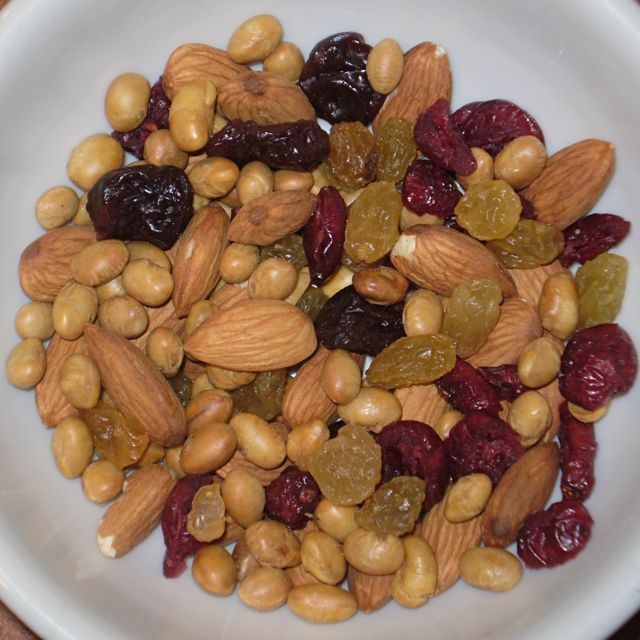 My desk is stocked with almonds, pistachios, peanuts, and dried apricots. I also have some crackers, cream cheese and Major Grey’s Chutney in the fridge at work in case of emergency. That has come in handy this week with my lack of preparation. My crisper is running low, but I want to empty it before restock. If I buy too frequently I overlook something and end up having to toss it. With my slim budget I don’t need to be throwing food way.